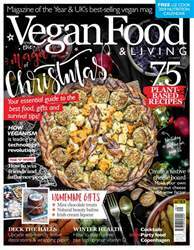 Christmas dinner traditionally centres around dishes made from animal products, so it’s little surprise that people are often anxious that they won’t be able to stuff themselves as much as they would have done before going vegan. Yet if you take a look at a vegan Christmas table, you will find it groaning under the weight of the wide variety of festive fare we can eat, and not just the traditional vegetable-based sides like sprouts and potatoes. Vegans are the masters of veg after all, so you won’t find bland, steamed veggies on our tables – no sir! And you can be sure that everything tastes that little bit sweete r knowing that no turkeys had to die in order to satisfy our taste buds.